Bigelow's BEAM module is likely to be an upscale version of the already orbiting Genesis module - two of which have already flown into Earth orbit. NASA has officially signed a deal to attach an inflatable private module to the International Space Station, space agency officials confirmed today (Jan. 11). Under the new deal, NASA will pay $17.8 million to the Nevada-based private spaceflight firm Bigelow Aerospace for the company's Bigelow Expandable Activity Module (BEAM), which will be affixed to the orbiting lab as a technology demonstration. "This partnership agreement for the use of expandable habitats represents a step forward in cutting-edge technology that can allow humans to thrive in space safely and affordably, and heralds important progress in U.S. commercial space innovation," NASA deputy chief Lori Garver said in a statement. Today's announcement confirms reports that surfaced earlier this week. Garver and Bigelow founder and president Robert Bigelow will discuss the BEAM program at a media event Jan. 16 at Bigelow Aerospace facilities in North Las Vegas, NASA officials said. 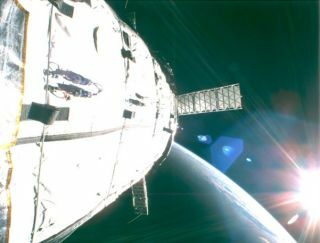 NASA officials have said that BEAM could be on orbit about two years after getting an official go-ahead. The module will likely be launched by one of the agency's commerical cargo suppliers, California-based SpaceX or Virginia-based Orbital Sciences Corp.
Bigelow's dreams don't stop at the International Space Station. The company wants to launch and link up several of its larger expandable modules to create private space stations, which could be used by a variety of clients. Tenants could get to orbiting Bigelow habitats in several different ways. The company has set up a partnership with SpaceX for use of its Dragon spacecraft and another one with Boeing, to use the aerospace giant's CST-100 capsule. Bigelow is also eyeing a possible outpost on the moon, for which the company envisions using its BA-330 modules (so named because they offer 330 cubic meters of usable internal volume). Several BA-330 habitats, along with propulsion tanks and power units, would be joined together in space and then flown down to the lunar surface. Lunar dirt would be piled over the modules to protect against radiation, thermal extremes and micrometeorite strikes. Then clients — be they explorers, scientists or tourists — could move in and set up shop on the moon. This is not the first time NASA has teamed up with a commercial spaceflight company for work on the International Space Station. The agency currently has billion-dollar contracts with SpaceX and Orbital Sciences to fly unmanned cargo missions to the station. SpaceX, which holds a $1.6 billion deal for 12 flights, launched its Dragon capsule on its first contracted cargo run last October. Orbital Sciences signed a $1.9 billion contract for eight missions; it's expected to launch test flights of its new robotic Cygnus cargo ship and Antares rocket this year. NASA is also helping private spaceflight companies develop new vehicles to ferry astronauts to and from low-Earth orbit. In 2010, the agency granted a total of $50 million to five firms, including Boeing and Colorado-based Sierra Nevada. Boeing, Sierra Nevada and SpaceX split $315 million in 2011 and $1.1 billion in another round of awards announced this past August. The space agency hopes at least one of these companies has a manned spaceship up and running by 2017.